The sofas in the house were feeling a bit lonely. Not fully appreciated. Tennis balls in the garage had only been used to play tennis with. The cows in the field grazed unscrutinized. Birds flitted around, uncontemplated. Bonnie was adopted from CASPCA by humans who visited the shelter trying to look casual and non-committal. Being that Bonnie doesn’t miss a thing, she could see that these humans were going to be pushovers for her blue coat and her big smile. And something told Bonnie these humans had a lot of improperly-used tennis balls around. Bonnie has made herself right at home with the Turners. She has a creative streak and often decorates her bed with “re-imagined” toys. She feels very confident when wearing teal and rhinestones. No more under-appreciated sofas, under-valued tennis balls, or unwatched cows. Only time flies by without notice. Who wears bow ties? Magicians, doctors, lawyers and anyone hoping to look “intellectual”, nerdy, formal. In the south, and on some college campuses, seems they’ve never gone out of style. Gage doesn’t wear the bow tie because he’s formal. And he doesn’t need the tie to show he’s smart. In fact, he’s redefining the whole bow tie look. Gage is wearing the tie because he’s celebrating finally living with a wonderful, loving family. After spending 16 months (yes, 16) at Fluvanna SPCA. And that was after spending years (yes, years) on a chain. His new family had lost two dogs in one summer and they weren’t looking to adopt. Then they saw Gage on WCYK 99.7. Gage looked like a perfect combo of the dogs they had lost, and their other dog, Lula, was lonely. When they brought Gage home, they immediately knew he was a perfect fit. Look at this dapper gentleman (who unashamedly loves blankets and plush toys). The only image he’s trying to convey is pure…simple…happiness. That was six years ago and Sarge (officially Sergeant Pepper) has been very busy since. He’s a certified therapy dog and visits school children and the elderly regularly. Sarge goes on dates with his four-legged girlfriend and hangs out with the family’s goats. Sleeps in a king-sized bed with his humans. 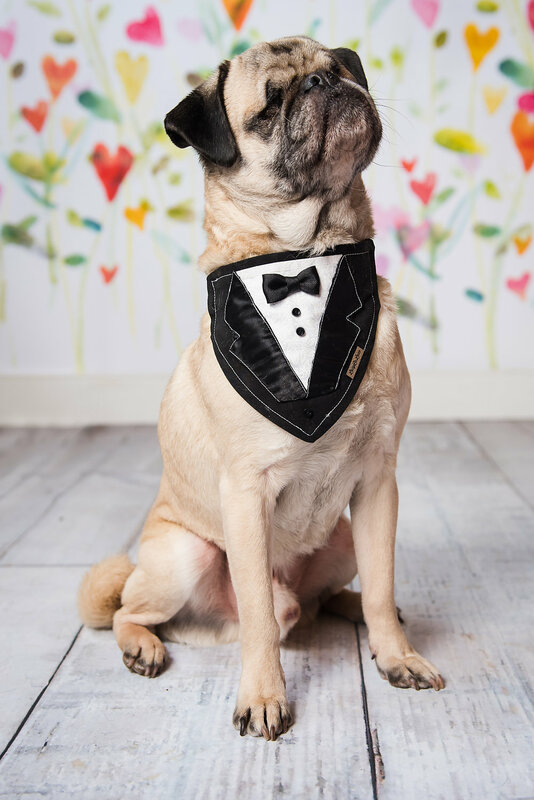 When Sarge strutted into our Valentine’s Day photo shoot, the first thing we noticed was that he was wearing a tuxedo. (We thought it a bit formal for the occasion but he was obviously out to impress his girlfriend.) With his fancy tuxedo and suave demeaner, Sarge melted our hearts like butter in a pan. About the fifth thing we noticed about Sarge was that he has no eyes. Oh, I get it. He sees with his heart. That’s the unusual part. Stu loves Toby. Toby loves Stu. Simple, sweet. There’s a lot to this story and maybe someday I’ll write a book about these two, but for now…let’s call this Part 1. Stu and Toby are a couple of dapper elderly gentlemen. Stu (the man) turned 85 recently. Toby (the dog, who’s a bit less candid about his age) is 10-ish. Toby thinks age is just a number and would rather celebrate his big brown eyes, his well-earned, strategically-placed wrinkles, and…Stu. For Stu’s milestone birthday, his amazing friends bought him a present. They hired Petography Cville to take photos of these two. Sure, Stu had some photos of Toby, but nothing you’d display on a wall or in a book. (And Toby didn’t have any good pics of Stu at all). This birthday present turned out to be a true gift to all involved…including us here at Petography Cville. Warm fuzzies, all around. The photos below are a small sample of that celebration of companionship. Do you have an elderly friend with a senior dog companion? Give the gift of a lifetime. Call us. We have special senior packages available. When you leave the house, you take an umbrella, in case it rains. Your water bottle, in case you get thirsty. Some snacks. You want to be prepared. Jeanie doesn’t leave the house without her toy turkey. Someone might want to play, and a girl needs to be prepared. Jeanie’s new owners had been heartbroken over the loss of their dog Steve who passed away in October. They wanted to do something to honor Steve’s memory, so they began volunteering at Caring For Creatures. When they met Jeanie, walked her, and then took her and toy turkey home for a snowy weekend, they were all gobbled up by her. Stuffed with love. The new family celebrated both New Year’s and Jeanie’s “gotcha” day all in one. Jeanie loves long walks, cuddling under a blanket, and tennis balls. She has several dog friends in the neighborhood who regularly stop by to see if Jeanie can come out and play. She’s always ready with her turkey. As I said, a girl needs to be prepared. I mean, seriously, check out that smile. That’s your marshmallows on your sweet potatoes! Some people say serendipity is just having your eyes open. Others say that serendipity rewards the prepared. Finding something without looking for it. I was walking down the road one day. Wasn’t having a very good day. Frankly, I hadn’t had a very good life. I was so exhausted and super skinny. And I was really pretty sad that I hadn’t found someone who might love me. Along the road I saw a woman who looked like an angel. I was a little scared at first and wasn’t sure about her at all. But she spent most of the day trying to be my friend, so I finally decided she must be really nice and I went home with her. Figured it couldn’t be any worse than what I’d already been through. Maybe she had food. I’m so glad I went home with this angel. She gave me a nice warm bed, lots of food and treats, a bath, a name (Chella!) and…her heart. And in turn I gave her mine. I love riding in the car with my angel to go on long walks and runs in the meadow, and curling up by the woodstove after. Blueberries are my favorite treat! Call this serendipity if you want. I call it coming home. Not unlike the delectable fruit she’s named after, cute bulldog Kiwi is a fuzzy brown powerhouse on the outside and a whole lot of sweetness inside. And, while we’re talking about the fruit, did you know that kiwi is a “super fruit” because it’s so good for you? It contains tons of vitamins, antioxidants and all that other healthy stuff. Undeniably, the fruit is good for us. But what about the dog? In early fall of 2017, Kim Matsko’s heart was breaking. Three of her bulldogs had passed away in a five-month period. Although not knowing if she was truly ready, she knew that the only thing to heal her heart was to find another furry, turned-up face to bring home. Kim also noticed that her older bulldog Tank became visibly depressed and was clearly missing his dog siblings. She feared for Tank’s health. Being a bulldog rescuer for many years, Kim found herself searching the bulldog rescue sites for a potential new family member. Landing on the Georgia English Bulldog Rescue (GEBR) Facebook page, Kim read about a bulldog puppy-mill bust that had recently taken place in Atlanta. A large warehouse had roughly 20 bulldogs and 20 other dogs in crates stacked on top of one another. With no air conditioning – in Georgia! This was a full-on breeding operation – the dogs were rarely let out of their crates, and they were certainly never let outside. Imagine a dog spending years of its life in a crate with no walks, no runs and very little human interaction. One of the dogs shown on GEBR’s website was Kiwi. A 2.5-year-old, 40-pound tawny bundle of love, Kiwi had never been out of a crate for any length of time. When Kim saw Kiwi she just knew she was the one to become her forever companion and help hers and Tank’s hearts heal. Kiwi had been used solely as a puppy-making machine and had already had 2-3 litters of puppies in her short life, as evidenced by her large, saggy teats. After the dogs were removed from the warehouse, Kiwi was vet-examined, spayed and put into a foster home for care and socialization, so the rescue group could get to know Kiwi’s personality. Once Kiwi was ready for Kim to adopt her, Kim jumped in the car and raced to the meeting place in South Carolina to meet her new friend-for-life. Although Kiwi had little muscle tone from being crate-bound, and it took a couple of weeks for Kiwi to get used to walking on anything but concrete, she is now happy and healthy and loves her toys, walks, treats and her new, best buddy Tank. Kiwi spends her daytime hours at Natural Pet Essentials (Kim’s pet supply store) where her duties include greeting and soliciting cuddles from customers, stealing treats from the bins, and napping. At the end of the day, Kiwi waddles happily home with Kim and Tank, her puppy-mill days having faded into a distant memory. Evidence certainly suggests both kiwi the fruit and Kiwi the dog are heart-healthy. About Georgia English Bulldog Rescue: Since 2009, the organization has rescued over 480 bulldogs. They rescue dogs who are sick, injured, abused and neglected, and at any given time have at least 40 bulldogs in foster.